Overall: Human triggered wind slab avalanches may be likely in steep isolated terrain above 11,000'. Watch for sun and warm temperatures destabilizing slopes. Some isolated storm slab instabilities were noted on March 14th, near 11,000’ on SE slopes of Core Ridge. However the potential for crack propagation appeared low at that location. Also, we found no significant wind slabs on E and SE slopes near treeline. Much of the transported snow was sublimated to the atmosphere, rather than formed into wind slabs. However, due to obscured and cloudy conditions, we did not get good views of much of the mountains, and we suspect that wind slab development is likely. Human triggered wind slab avalanches may be likely near and above treeline. Winter continued this past week with another storm cycle and N to NW winds of 20-40 mph at treeline.That event brings the season snowfall total to over 300" at 10,800'. Overall the snowpack structure exhibits a wide variety of characteristics based on aspect and elevation. At treeline on N, W and SW aspects, the snowpack has moderate strength, poor to moderate structure and low to moderate energy. Last weekend on northerly slopes of Doyle, we found large temperature gradients forming near surface facets. At that time, those weak layers did not show propagation propensity. Read more about BJ's tour, and spring travel advice. This tour was post storm cycle of 18 inches reported by ASB. The storm did make history as a "Bomb Cyclone" as it moved off to the East. We did get quite bit of wind out of the NW during and after the event. East winds today with good "Wrap around moisture". The Wind densified the snowpack and created some storm slab on some aspects. No cracking, whumping or other avalanche activity was observed on our tour. All data has been recorded on the Project worksheet. Snow distribution and measurements ranged from wind scoured treeline site at 20 cm to 249 cm at Midway catwalk Historical ASB site. This storm cycle started very warm and wet producing right side up snowpack with significant wind transport. Ski conditions are the best its been in years. We descended the Pro Bass Tour of 7 Meadows in 12 to 18 inches of consistent powder. A bit densified near treeline, but fluffy below. Snowpack overall on our tour showing good stability, no energy, fair structure and good strength. We are getting close to the spring equinox and it is time to think about spring travel strategies. The most recent winds are from the east-northeast. Watch for new slabs on west and southwest slopes. Expect wind directions to change. Avoid standing on overhung cornices, as they may collapse unpredictably and send you downslope. They can sometimes break far back on flat ridge-top terrain. Sunny warm weather can naturally release cornices. Weather obscured our Inner Basin observations on Thursday. Weather update Thursday March 14th. 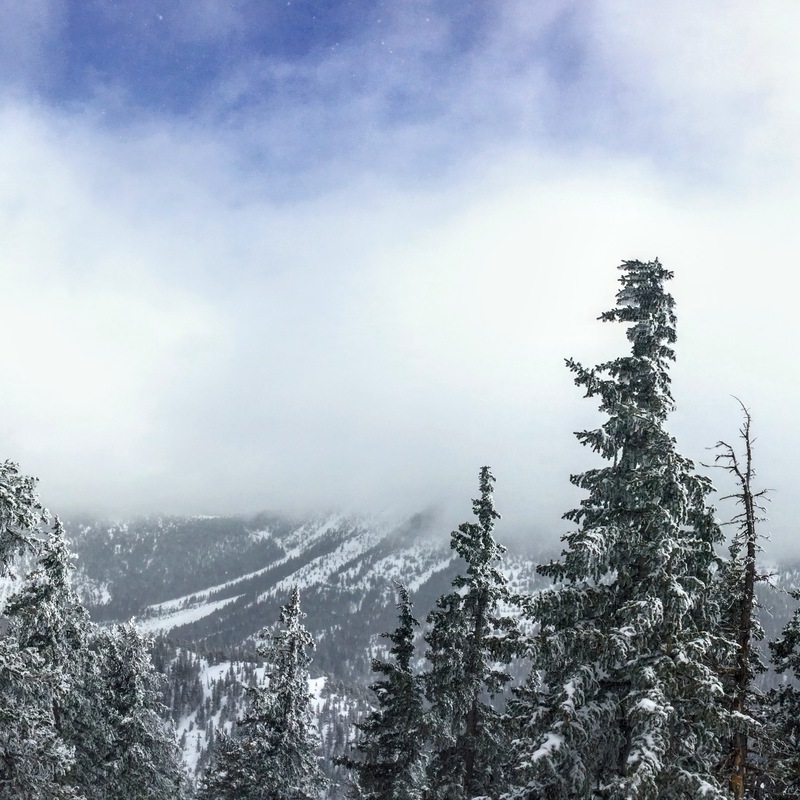 Over the week, 18” of new snow was recorded at 10,800’ on Arizona Snowbowl. The snowline started out at ~7500’ and dropped to 5500’ by its culmination on Wednesday morning March 13th. Snow transporting winds out of the southwest kicked up on Tuesday night, with post-frontal winds shifting to the north and northwest on Wednesday midday. Cold temperatures, breezy winds and lingering snow flurries characterized the aftermath of the storm, but with little further snow accumulation. Mostly sunny skies, with seasonally average temperatures, are on tap for the weekend. Renewed chances of snow showers are foretasted for early in the workweek, but with little prospect of significant accumulation. A better chance for a more productive storm will arrive midweek, but this low pressure trough is currently too far away for accurate predictions of trajectory, precipitation potential or precise timing of impact. On Thursday, March 14th, the Inner Basin SNOTEL site (Snowslide) reported a snow depth of 74” (188 cm) at 9,730'. Arizona Snowbowl reported a settled base of 98” (249 cm) at 10,800'. So far this winter, 306" (777 cm) of snow has fallen at the mid-mountain study site. Since March 8th, SNOTEL temperatures have ranged between -1° F on March 14th, and 38° F also on March 9th and 13th. For the same period, ASBTP (11,555') reported temperatures between 3.5° F on March 14th, and 30.5° F on March 12th.